The Regina Pats Hockey Club is excited to celebrate its 100th Anniversary Season in 2017-18. Over each of the 10 months from August to May, the club will feature every decade of Pats hockey. Up next, Decade three from 1937 to 1946. From 1936-37 to 1945-46 there were no Pats playing in Regina. The power of the press became evident in the fall of 1946 and a suggestion by Tom (Scotty) Melville in his daily column in The Leader Post, that the Abbotts and Commandos join forces to give the Queen City a top notch contender drew little support from either of the rival camps. Sticking to his guns in the traditional fashion of a true and rather stubborn Scot, Mr. Melville proved his point in a rather odd manner. “Sick and tired of watching Moose Jaw clobber us at every turn,” is the way Mr. Melville describes the junior situation at that time. While his suggestion went unheeded he did manage to arrange an exhibition game in Regina that winter between a hand-picked all-star squad made up of players from both the Abbott and Commando clubs and the highly rated Port Arthur Club. History shoes that the Lakehead club had arranged a similar game in Winnipeg against the Monarchs and it was at this time that Mr. Melville set up the Regina game. Part of the deal included a game in Moose Jaw against the Canucks on the following night. The combined Regina club clobbered the Lakehead squad 9-3 and the following evening the Canucks had to come from behind to gain a 5-5 draw. The outcome gave Tom all the ammunition he needed for his daily column. And now even the most adamant of the executives of both clubs began to take heed. Several meetings were fruitless and in a last ditch stand, Clarence Mahon was named to chair the final meeting between the feuding club executives. The meeting proved to be successful and resulted in the re-birth of the Regina Pats. 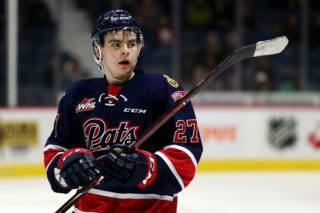 The new Pats joined the Moose Jaw Canucks, Saskatoon Legionnaires, Prince Albert Black Hawks, Humboldt Indians and Notre Dame Hounds in the Saskatchewan Junior Hockey League. The Pats were to play a 30 game schedule but only ended up playing 29 of them as Moose Jaw couldn’t find transportation for a game in February. The Pats finished up in first place with a 25-4-0 record scoring 201 goals and allowing just 82. League Semi-Final – The Pats faced off with the Black Hawks from Prince Albert in the first round of the playoffs in a best of three. The game started off in a close checking affair and Prince Albert took a 1-0 lead after the first period. The second period continued that way as the PA club took a 2-0 lead but the Pats scored less than 2 minutes later to cut the lead to 2-1 and started taking the edge in play and finished the 2nd period leading 3-2. The third period didn’t get any better for Prince Albert as the Pats scored just over a minute in and tallied five more times to take the game 9-2. Red Staley led the way with 2 goals and 2 assists. Game 2 started off similarly with The Prince Albert team holding the Pats in check going into the first intermission at 1-1. The Pats started opening it up in the 2nd, scoring 3 goals to take a 4-1 lead. The Pats then scored the first 6 goals in the third period before Prince Albert scored late to make the final score 10-2, Red Staley led the way with the hat trick and Dunc Fisher had a goal and 3 assists in the game. The Pats won the round 2 games to 0. 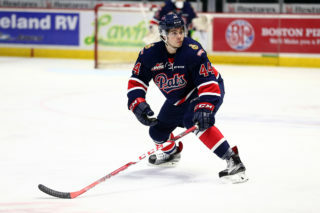 League Final – The Pats faced off with the Moose Jaw Canucks. 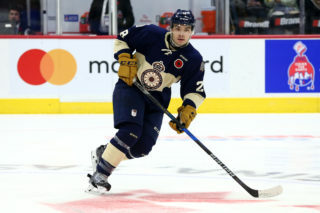 With Metro Prystai coming back from a leg injury he figured in on 6 of the 7 goals Moose Jaw Scored in a 7-6 Canucks win in game 1. 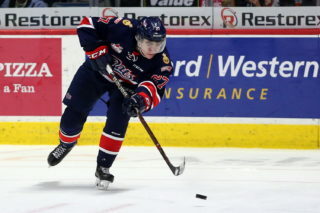 Moe Young had 2 goals for the Pats, Gord Knutson and Red Staley each had 3-point nights (a goal and 2 assists each). The Pats fell 5-3 in game 2 as Prystai figured in on 4 of the teams 5 goals on the night. Red Staley tallied twice in the losing effort. 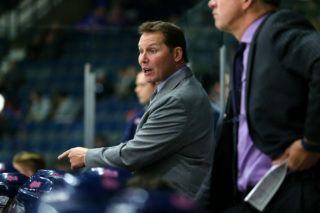 The Pats held a special meeting with the players, coach, manager and the executives after the game and it paid off with the Pats winning game three 4-2. The Pats promised that they wouldn’t let the fans down and 6.588 paying customers went home happy. Dunc Fisher scored 2 of the Pats goals while Moe Young and Gord Knutson had singles. Down 2 games to 1 playing game 4 in Moose Jaw “while a rafter-jammed rink of more than 3,500 supporters hysterically cheered them on, Canucks handed the death blow – a 3-1 decision that gave them the series three games to one. It was a terrific show to end a terrific series, with Canucks retaining the Saskatchewan title they held for the past two years” (the Leader Post).